[160 Pages Report] Demulsifier Market was valued at USD 2.09 Billion in 2016 and is projected to grow at a CAGR of 3.53% from 2017 to 2022. The base year considered for the study is 2016 and the forecast period is from 2017 to 2022. The research methodology used to estimate and project the market size included the top-down and bottom-up approaches. The total size of the demulsifier market was calculated and accordingly, weightages were provided to various segments. This was done on the basis of extensive primary interviews and secondary research based on the information available on websites of various associations such as Energy Information Administration (EIA), Organization of the Petroleum Exporting Countries (OPEC), Society of Chemical Manufacturers and Affiliates (SOCMA), and European Oilfield Speciality Chemicals Association (EOSCA). Primary research conducted for this report included extensive interviews with key experts such as CEOs, VPs, directors, and executives. After arriving at the overall market size, the total market was split into several segments and subsegments. Data triangulation and market breakdown procedures were employed to complete the overall market engineering process and arrive at the exact statistics for all the segments and the subsegments. The breakdown of profiles of primary respondents is depicted in the figure below. The ecosystem of the demulsifier market comprises distributors/suppliers of demulsifiers. Some of the major companies operating in this market are Schlumberger Limited (U.S.), Halliburton (U.S.), Baker Hughes Incorporated (U.S.), BASF SE (Germany), Ecolab Inc. (U.S.), The Dow Chemical Company (U.S.), Clariant AG (Switzerland), Croda International Plc (U.K.), AkzoNobel N.V. (Netherlands), and Momentive Performance Materials, Inc. (U.S.). Along with the market data, MarketsandMarkets offers customizations according to the client-specific needs. The demulsifier market is projected to grow from USD 2.12 Billion in 2017 to USD 2.53 Billion by 2022, at a CAGR of 3.53% from 2017 to 2022. Increase in crude oil production, along with the production of heavy oil is expected to drive the demulsifier market during the forecast period, as heavy oil consume relatively higher quantity of demulsifier for breaking emulsion. The demulsifier market is segmented on the basis of type, application, and region. Based on type, the oil soluble segment is estimated to lead the demulsifier market during the forecast period. The high share of the oil soluble segment, in terms of value, can be attributed to the increasing demand for this type of demulsifier in emulsion breaking. 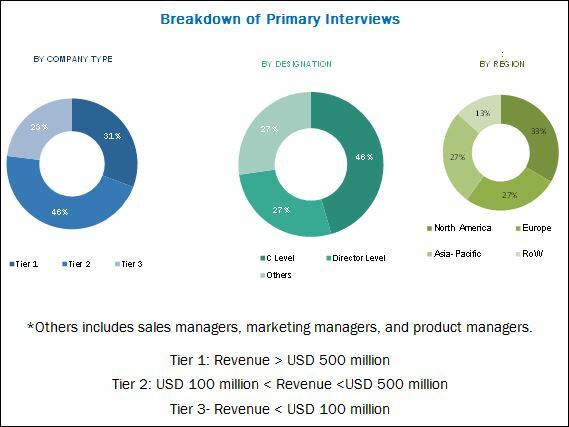 On the basis of application, the demulsifier market has been segmented into crude oil, petro refineries, lubricant manufacturing, oil based power plants, sludge oil treatment, and others (dyes & pigments, cotton seed oil, pharmaceutical, and pesticides). The crude oil application segment is projected to grow at the highest CAGR, due to the increasing demand for oil and related derivatives, which results in high production of crude oil globally. The global production of crude oil increasing, as most countries are focusing on extracting more from existing as well as new and unconventional reserves. The crude oil segment accounted for the largest share of the demulsifier market in 2016. 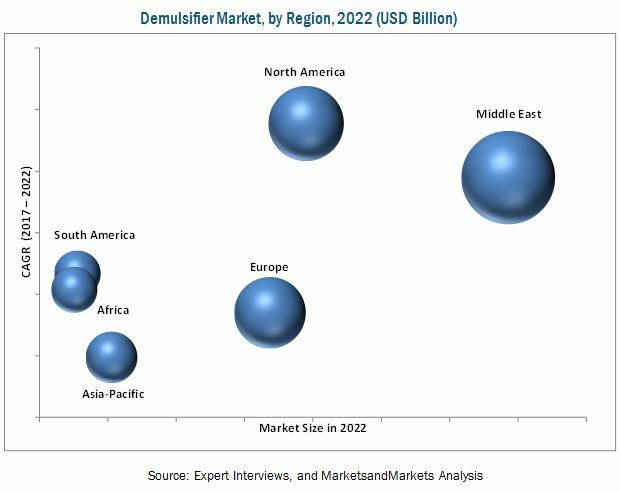 The demulsifier market has been studied for the Middle East, North America, Europe, Asia-Pacific, Africa, and South America. The demulsifier market in North America is projected to grow at the highest rate from 2017 to 2022. Crude oil is a major application of demulsifier in the region, as majority of the crude oil produced in the region is from offshore oilfields, shale formations & tight oil, and oil sands. Crude oil production from offshore production and oil sands results in higher consumption of demulsifiers as compared to the onshore production. This is likely to lead to a high demand for demulsifiers in the region. The key constraint to the growth of the demulsifier market is stringent environmental legislations. Demulsifier is major subsegment of oil field chemicals with major application in the crude oil production. The major restraint for the market is stringent environmental legislations. Increasing concerns over the impact of chemicals on the environment has led to stringent regulatory constraints on demulsifier manufacturing. Growing deep-water operations around the globe raises concerns regarding the protection of the marine environment and its sustainability. There are increasing regulatory controls related to chemicals used in deep-water operations. New product launches and acquisitions were the major strategies adopted by most players in the market. Companies such as Schlumberger Limited (U.S.), Halliburton (U.S.), Baker Hughes Incorporated (U.S.), BASF SE (Germany), Ecolab Inc. (U.S.), The Dow Chemical Company (U.S.), Clariant AG (Switzerland), Croda International Plc (U.K.), AkzoNobel N.V. (Netherlands), and Momentive Performance Materials, Inc. (U.S.) are the key players who adopted these strategies to increase their customer base, widen their product portfolio, and remain competitive in the market. Companies aim to widen their product portfolio and geographic presence to cater to the increasing demand for demulsifiers from end users. 11.9 Momentive Performance Materials Inc.
11.11.12 Impact Chemical Technologies Inc.
11.11.13 Oil Technics Holdings Ltd.